The fifth generation is here! The entire RAM lineup has been redesigned for the 2019 model year, and that of course includes the RAM 2500. 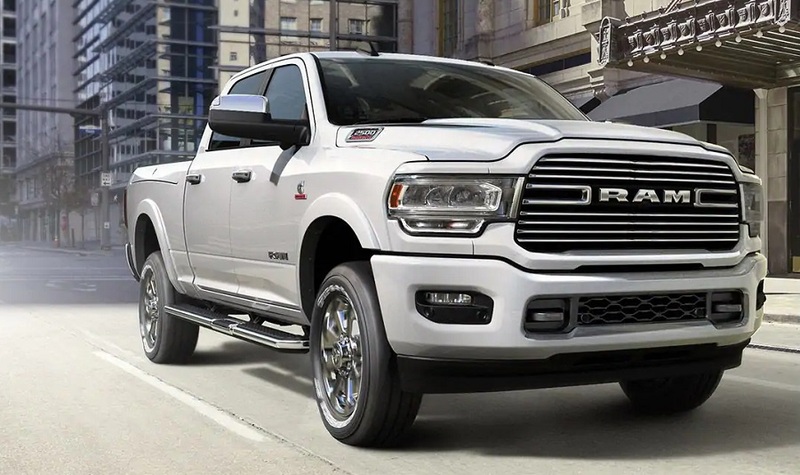 You can see, touch and test-drive a broad selection of 2019 RAM 2500 models across all trims in Albuquerque New Mexico at our location near Los Lunas Santa Fe Farmington. So, what is new for the 2019 model year? Get ready for best in class because you are going to hear it and read it often. That includes best-in-class horsepower, towing capacity and much more. 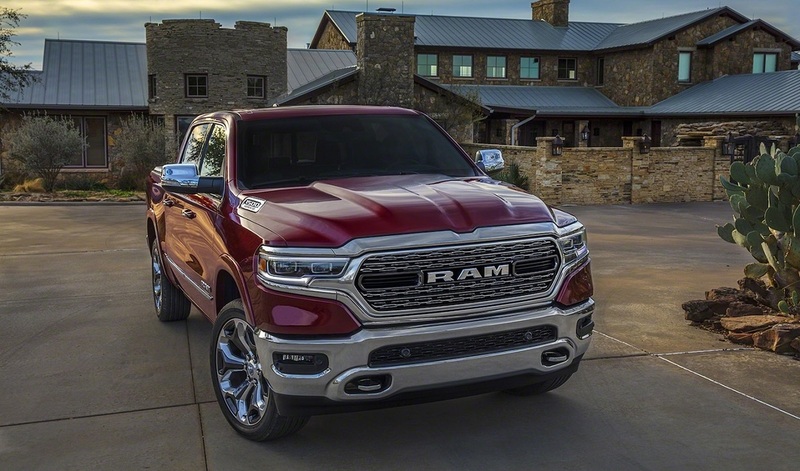 With the 2019 RAM 2500 exterior-which you can see firsthand out our location in Albuquerque New Mexico-RAM did a fantastic job of modernizing while remaining true to the iconic RAM aesthetic. This is a bold design that really makes a statement, and some of the accents include striking LED headlamps, premium LED taillamps and mirrors that are powered and heated and feature memory options. Options include power running boards for easier entry and exit. The tailgate features a dampened and power release. You also have access to the RamBox cargo management system, which is class-exclusive and features LED lighting, a 115-volt outlet and drainage. 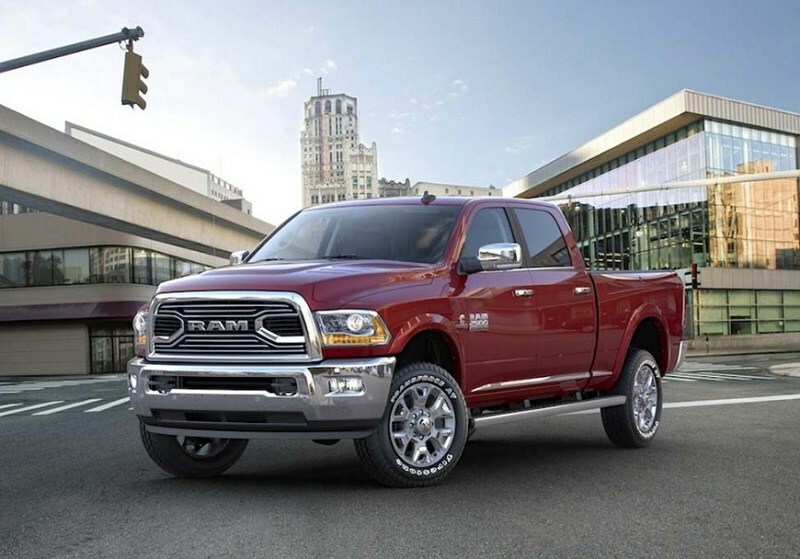 All RAM trucks are available with either the Regular or Crew Cab. The 2500 is also available in the Mega, which is 43.3 inches and provides 130.5 cubic feet. Box sizes for the 2500 range from 6.4 to 8 inches and 57.5 to 74.7 cubic feet, respectively. 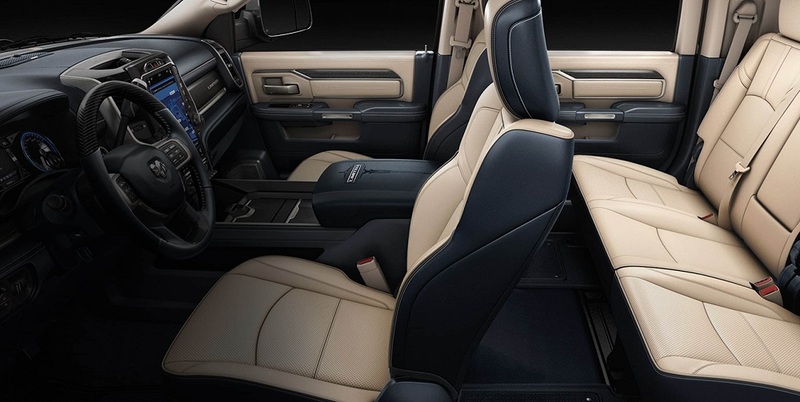 The 2019 RAM 2500 in Albuquerque boasts the most luxurious interior in its class. That includes 100-percent leather seating for the Laramie Longhorn and Limited trims. The Limited features more real wood than any other truck in the class. The Power Wagon, on the other hand, has had a graphite interior added that is designed to complement the brawny and rugged feel of the truck. The center console has been redesigned to accommodate those drivers who use their trucks like a second office. It has best-in-class storage, can accommodate a 15-inch laptop and has a docking area for smartphones, laptops and other devices. The 2019 RAM 2500 in Albuquerque offers three engine options. The 6.7L Cummins Turbo Diesel I6 is a proven legend that gives you 370 horsepower and 800 pound-feet of torque. The available 5.7L HEMI V8 generates 383 hp and 400 lb.-ft., and the available 6.4L HEMI V8 delivers 410 hp and 429 lb.-ft. With the 6.7L Cummins, you have your choice of six-speed automatic or manual transmission. The manual has been modified for increased torque load and features a wear-compensating clutch so that it feels new until it is time to replace it. The automatic is standard with both HEMI options. It is sophisticated, electronically controlled and designed to optimize both performance and efficiency. The 2019 RAM 2500 in Albuquerque features a command center, the centerpiece of which is the 8.4-inch touchscreen for the Uconnect system. This screen size is largest-in-class. There are also multiple RAM 2500 specials for the optional Uconnect 4C NAV, which gives you HD Radio, 4G LTE, SiriusXM Guardian and more. Other features include vehicle finder, remote key lock and SOS Call. RAM has also put a focus on safety with this generation, and there are now more than 100 standard and available safety and security features. This includes an all-new blind-spot monitoring system with rear cross path detection as well as trailer detection. Other options include smart cruising with adaptive cruise control as well as guided parking with paralleled and perpendicular park assist. 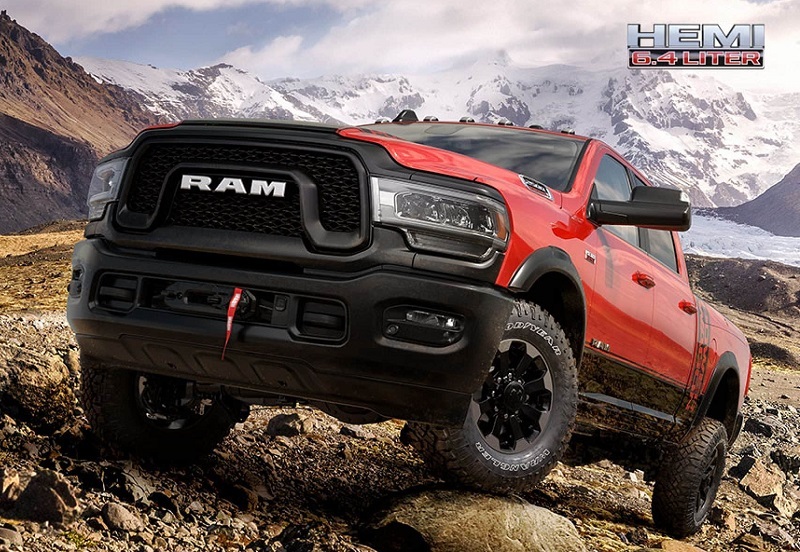 There are RAM 2500 specials available at dealers near Los Lunas Santa Fe Farmington for all six trim levels: Tradesman, Big Horn, Power Wagon, Laramie, Longhorn and Limited. The Tradesman is the basic trim, and it is ideal as a no-frills work truck or for the cost-conscious buyers who want to pick and choose their features. The Tradesman is available in either an ST and SLT configuration. SLT stands for standard luxury trim and adds air conditioning and other amenities that most deem essential. The Big Horn upgrades Uconnect to an 8.4-inch screen, features 18-inch polished aluminum wheels and provides seating for up to six people. The Laramie also features a customizable 7-inch digital driver information display and ParkSense front and rear park assist. With the Laramie Longhorn, you get a leather-wrapped steering wheel, real wood accents and other upscale amenities. The Power Wagon is an off-road-focused configuration, and the Limited is the loaded offering with just about everything. The 2019 RAM 2500 is unlike any RAM 2500 before it. It is truly something to behold, and you will find a broad selection across all trim levels at our dealership in Albuquerque New Mexico near Los Lunas Santa Fe Farmington. Better yet, there are many great RAM 2500 specials available to you. There has never been a better time to lease or finance a 2500, and we have options for every budget. Visit us for a test-drive today, or contact us online or call ahead to get the ball rolling on owning your dream truck.